Located in the Etna Regional Park, just outside the small town of Linguaglossa, the Villa Neri Resort & Spa is located 15 km away from an equipped beach and approximately 45 km from Catania Fontanarossa Airport. The Resort, a member of the prestigious international brand "Small Luxury Hotels of the World", is in keeping with the nature that surrounds it: the perfectly manicured green spaces, the typical colors of Sicilian homes, the swimming pool and the courtyard Dodici Fontane (the twelve fountains) recalling the old troughs help to create classy setting, with strong traditional atmosphere. 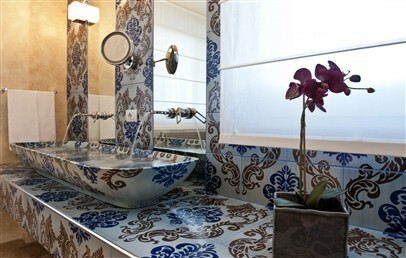 These references to tradition are cleverly blended with modern elements: the Villa Neri Resort & Spa wants to convey the Sicilian hospitality known throughout the world, but with a modern touch. Classic – on the ground floor, they have a private patio. 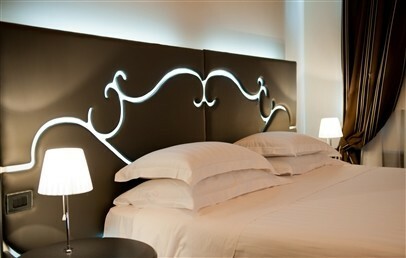 Superior – on the ground or on the first floor, they have a balcony or patio with views of Mount Etna. 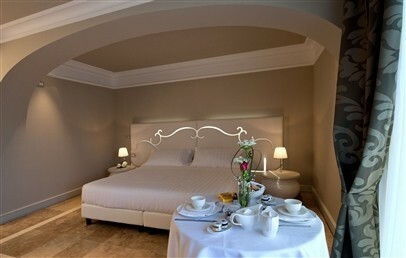 Junior Suite – lon the ground or on the first floor, they feature a chromo therapy shower, a balcony or large windows overlooking Mount Etna and the Mediterranean Sea. Furthermore, Villa Neri offers other accommodations with a higher level of comfort and these are:2-level Suite, Suite Feudo and Suite Feudo Arrigo, going from 37 to 85 sqm. The Petra Spa has a wide range of treatments, based on spices, citrus fruits and essences of the territory. Guests are spoiled for choice of sauna, turkish bath, emotional shower, heated swimming pool with whirlpool, ice fountain and many other treatments designed to relax body and mind. To complete the relaxing path, the delicious organic herbal teas and fruit are served in the lounge area, where you can relax in the comfortable waterbeds. Admission to the SPA is free of charge. The restaurant "Dodici Fontane" is open for dinner and offers the best of the Sicilian specialties and gourmet cuisine. The degustation menu is served with a wide selection of Sicilian vines. In the morning the breakfast is served in the dining room decorated with antique pieces of furniture. The works of art of the master Salvatore Incorpora, internationally renowned artist who has been able to interpret the territory of Etna and Linguaglossa, embellish the areas of the Hotel and the most prestigious rooms. The beautiful pool in front of the restaurant, immersed in the scents of olive trees, is available to guests for moments of pure relaxation. Double room located on the first floor; bathroom with shower. Private patio. Double room with elegant panelling and elegant furniture, with a private bathroom with shower, located on the first or on the ground floor. It can have a balcony, a patio with view on the Mount Etna or a window. 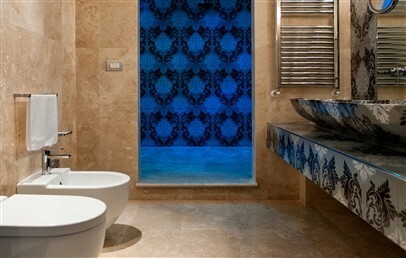 The Deluxe room has a private bathroom with chromotherapy-shower for two. It has a small wine cellar with a selection of wines. It is located on the ground or on the first floor with either a private terrace or a window. 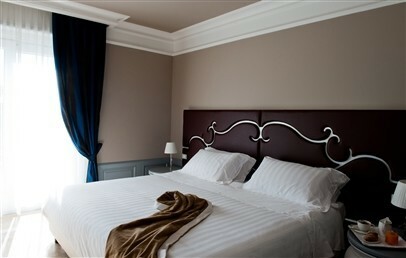 The Junior Suites are comfortably furnished and have a King size bed. They may have either a small terrace with view on Mount Etna or two large windows with view on the countryside and on the horizon, Taormina and the sea. 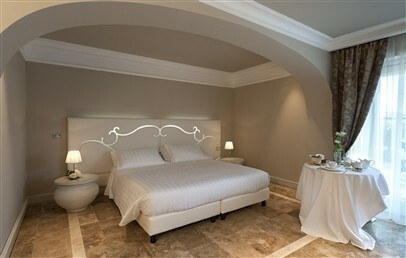 All rooms have a bathroom lined in fine marble, large sink, a tub and a separate shower, a fireplace and a mini wine cellar with selected wines. 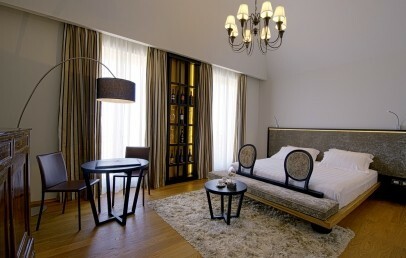 Guests will receive a wine bottle in the room. 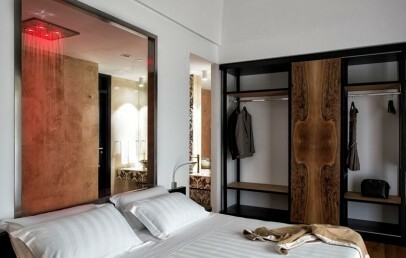 Some Suite are distributed on two levels and others are open space Suites. The ones on two level have a living area on the entrance level with sofa bed and a bathroom with shower finished with fine marble and on the upper floor, under the roof, is the night zone with another bathroom. The Suite with windows overlooks the sea and has a Jacuzzi tub, another Suite instead has a furnished terrace with view on Mount Etna and has an elegant freestanding tub located in the night zone. The Suite offers a small wine cellar with a selection of good wines, a Hi-Fi System, coffee machine, bathrobes and free access to the SPA. At the arrival guests receive a wine bottle in the room. 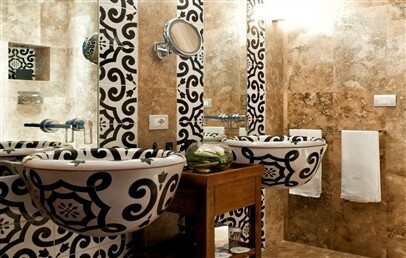 This Suite is composed of two bedrooms: each one has its own bathroom with shower or tub. 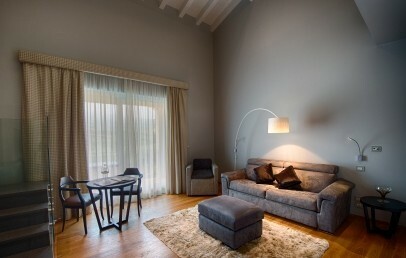 The living room has a fireplace and mini wine cellar with selected wines. A wonderful view of the surrounding territory is given from the living room and from the large terrace, that goes from Mount Etna to Taormina bay.